A memory card is all but required for any Playstation 2 game since the Playstation 2 did not have a built in hard drive for storing game saves or data. Following the same general design of the PS1 memory cards, the PS2 cards are about 2.25" long, 1.75" wide, 0.25" tall and weigh 0.4 ounces. They're fairly durable -- mine have held up fine to being dropped, thrown and stepped on. You can plug in two of these cards at once, one directly above each of the the controller ports on the front of the PS2. Memory cards for the PS2 are much faster than memory cards for the original Playstation, they're MagicGate encrypted and they hold a lot more data as well. Official PS2 memory cards hold 8MB of data each, which is usually adequate for playing a few games at a time. Every game uses a different amount of space to save its data; some may only take a few kilobytes, while others can take multiple megabytes. This means that how many games you are able to save on a card varies depending on which games you are playing. One card may store 5 game saves, while another may store 30. To help save space, PS2 memory cards only use as much space as they need for the save. Conversely, original Playstation cards stored their data in blocks -- which meant if your save took up 1.001 blocks of space, then it was going to use 2 full blocks on your card regardless. Being made by Sony, these cards are pretty reliable. I've had mine for many years and they're still in perfect working condition, while one of the three third-party memory cards I own has failed and another likes to erase itself every so often for no apparent reason. Sure, two of my third-party cards hold 16MB and the other holds 32MB, but the extra space is pointless if you can't use it. For this reason alone I recommend getting the higher quality Sony brand memory cards. These days you can easily find a two pack like this for $20, which is less than half of what I paid for these many years ago. Another thing I really like about this set is that it comes with two different colored semi-transparent cards, one in Crimson Red and the other in Island Blue. When we originally purchased these, my girlfriend and I were both playing PS2 games and it was really nice to have different colored cards so that we could tell them apart at a glance. They still have the 0.75" tall flat spot on the face of each card like the flat black cards, where you can place a label to identify the card in case you have multiples of the same color that you want to tell apart. Entirely different colored cards is just way easier to distinguish at a glance, and is much appreciated. We had a couple of other generic controllers from MadCatz, and one day the end of one of them broke off while unplugging it from the Playstation 2. The wires inside the connector had broken and it was not easily fixable, so the next time I was at GameStop I picked up an inexpensive replacement. The new controller is the Pelican PL-6688 from Performance Designed Products. This inexpensive product is made in China and only set me back about $10. The Pelican controller has a matte black finish and features an intended oval design in the center with the Pelican logo in it. It's generally the same as the original DualShock controller that came with the Playstation 2, with a few minor changes. First, and probably most noticeable, is the layout of the L1, L2, R1, and R2 shoulder buttons. Instead of residing on extruding humps like the DualShock, they are mounted nearly flush with the slightly curved top of the controller. I find them a little more comfortable to access, but the bottom L2 and R2 buttons need to be pressed closer to the middle of the controller to work correctly. On the DualShock, even hitting the outside edge of these buttons depresses them fully. It's not a deal breaker by any means, but it takes a little getting used to. The dual analog sticks are also about 1/8" smaller in diameter than the sticks on the original DualShock. While it's easy to spot by looking at the controller, I noticed no difference during gameplay so this has been a non-issue for me. The location and spacing of the sticks is identical to the DualShock. The start and select buttons are similarly in the same location, but tilted slightly downward in the middle. The analog button is circular instead of rectangular, as is the red analog LED indicator light. The final notable change is the directional pad. While the DualShock had spacing between the four directions, the Pelican controller features one solid piece with a cross on top of a circular design. I found this easier to work with diagonal directions, and the cardinal directions suffered no issues in the process, so I call this one a win as well. The remaining square, x, o and triangle buttons are in precisely the same location as the DualShock, though they seem to stick up a minuscule amount further. This did not detract from usability or responsiveness during gameplay, and in fact was pretty insignificant. When playing with the controller, the handles that you grip on either side of the controller feel just the smallest bit thicker than on the DualShock. This makes the controller feel sturdy in the hand, but not so much that it's uncomfortable for smaller hands. It's a negligible difference, but one that's appreciated. The cord is just as thick and flexible as on the DualShock, and at 79" of length it comes up just 1" short of the DualShock. It's fully analog and retains the same general off-balanced motors in the handles for rumble/force feedback support. We've had the Pelican controller for about 6 months now, and it's held up admirably. It's been tossed around, played with by my young nieces, tripped over and yanked out of the Playstation 2, and has never given me a problem. Despite being just as durable, the Pelican controller is actually a little lighter than the DualShock, coming it at 5.3 oz compared to the DualShock's 6.4 oz. I've played a lot of games since I've started using this controller including Final Fantasy X, Pinball Hall of Fame, Ar Tonellico, Madden NFL 11 and Grand Theft Auto: San Andreas among others. The controller has always been responsive and accurate, with the only small issue being the aforementioned R2 and L2 buttons that took some getting used to. Overall, it's been a very good controller and I'm considering picking up another one for a spare. Dungeon Defenders is a 3D fantasy game by Trendy Entertainment that features a rather unique blend of action RPG and tower defense elements. It retails for $14.99 on Steam, and I was looking at it for a week or so before I finally decided to purchase it. Luckily when I did go to buy it, there was a 75% off Steam sale and I was able to pick up Dungeon Defenders for a little under $4 a copy. I actually picked up a 4 pack and gave the other copies to friends and family so that we could play together. All of the DLC (downloadable content) for the game was on sale for 75% off as well, and I went ahead and purchased all of it for my copy while I was at it. The game has co-op multiplayer in split-screen, over the LAN and/or over the internet. This is drop-in-drop out, allowing up to 4 people to join and leave freely without restarting the game. The more players are in the game, the more enemies come in each wave and the tougher the enemies become. In general, this keeps the game fairly balanced regardless of how many people are playing. There are some maps however that are just harder to complete single-player, such as Glitterhelm Caverns, where the enemy spawn points are spread out and it's hard to keep an eye on all of them at once. The main goal of Dungeon Defenders is to protect what are called Eternia Crystals from increasing waves of enemies. Enemies come out of set spawn points and make their way towards the crystals. These crystals have a limited amount of health, and when they get destroyed you lose the level. In the beginning of the game there is a single crystal on each map to protect, but by the end you will find yourself having to protect up to four of them at once. Players can initially choose from one of four characters, the Squire, the Huntress, the Monk and the Apprentice. These classes are labeled as to the approximate difficulty of playing with them. The Apprentice and the Squire being the easiest classes to use, and the Monk and the Huntress best used after you've gotten the hang of the game and how it plays. Each class gets five different "towers" that they can setup to help defeat enemies. Most of the reason that the Apprentice and Squire are easier to use is that they each have walls as one of their towers that can block off choke points for their towers to do their work. The Monk and the Huntress actually don't have physical towers at all, instead the Monk has Auras and the Huntress has Traps. There's a pretty good variety as far as towers go. Squires have physical towers with a lot of health -- harpoons, spiked walls, etc. This makes them very versatile as they're always useful to some extent. The Apprentice has magical towers -- fireball towers, lightning towers, magic missile towers. They do a lot of damage, but half the towers do elemental damage only. Since enemies can have elemental resistances (an enemy with a small fire icon beside his name is totally immune to fire damage) this makes them slightly less versatile than the Squire towers. The Apprentice does have a magic wall which strips the elemental resistance from any enemy that hits it though, and his magic missile tower and deadly strike tower have no elemental affinity, so this isn't a problem most of the time. The Monk lays down Auras which cover an area of the map. Ensnare aura slows down all non-poison immune enemies that walk through it; electric aura damages all non-lightning immune enemies, healing aura heals all players who are standing in it, etc. These are ridiculously useful, but since the Monk has no physical barricade to keep enemies from just walking through choke points, it's a bit more difficult to play. The same holds true for the Huntress with her traps. Proximity mines blow up and damage enemies that walk over them, gas traps blow up and stun non-poison immune enemies temporarily when walked over, etc. Again, really useful but lacking a physical barricade of any kind. To make things even more interesting, you can use multiple classes in one map. Start the game on a Squire, go throw up some barricades and towers, and then go over to the forge and switch to your Monk. Now you can lay down Monk auras in front of your Squire towers. Switch again to your Apprentice and you can throw up some fireball towers to help out behind the barricades. It's this ability to strategize that makes the game so much fun. Granted, this becomes less important in multiplayer mode because you're likely to have different classes in the game all at the same time anyway. You're given a set number of defense units for each map. Every tower takes up a certain amount of units, and when you've reached this limit you cannot build any more towers. This helps balance the game out so that you can't just spam tons of towers all over the place and overwhelm any challenge the map may otherwise present. On top of this, towers cost "mana" to place, which is the game's currency. There are a few treasure chests that you can open once per wave on the map that drop mana (and sometimes items after the first wave). This is your starting mana pool, and it limits what you can initially build to start the map. There are 7 different types of normal enemies, plus the ogres add an additional challenge to some maps. Some enemies charge up and melee, one shoots arrows, one ignites some dynamite and charges at you full speed... one even heals groups of enemies and summons skeletons. The ogres are huge enemies that hit hard, have a lot of health, and can overwhelm defenses if you're not prepared for them. At least ogres don't have an elemental immunity in the standard game. While there's not a large variety of enemies, they do have versions using alternate colors to let you know that they are much stronger than the originals. In addition, there's a large boss enemy at the end of the 4th, 8th and 12th map that always drops a set piece of equipment depending on what class you are playing when you defeat them. There are also only like 14 maps to play on and none of them are excessively large, so overall the variety of locations and enemies is a little lacking. It's not too bad though, and there are various challenge missions available for each map to keep things interesting. In addition, there are multiple ways to play the game. For instance, there's a pure strategy mode that you play with only towers. You're unable to interact with the enemies in this mode, and face increasing waves of enemies that your towers must destroy alone. There's also a survival mode where you fight through like 25 waves of enemies, as well as multiple difficulty settings for every map. Playing a map in survival mode on insane difficulty will have enemies numbering in the thousands on later waves, and may take you a few hours to complete (if you can complete it at all). Be prepared to invest a lot of time in this game. There's also a lot of loot in Dungeon Defenders to help you along the way. You can pick up helmets, armor, gloves, boots, weapons and pets. Unfortunately your character's looks do not change as you put on armor, but picking up a new weapon will show that weapon in your character's hands. You can unlock different outfits to change your characters looks, but I have to admit I'm a sucker for games where you can actually see your newly acquired armor equipped on your character. There are a number of DLC packs available that add in additional characters, equipment, maps and costumes. It's all relatively inexpensive, though some are more worth purchasing than others. Aside from the tower aspect, you can also run around with your character and attack enemies directly. The Squire is a melee class, the Apprentice attacks from range with magical staves and the Huntress shoots from range with various guns and bows. The Monk is unique in the fact that he can both melee and attack from range, but which is stronger depends a lot on your weapon. Different weapons have different amounts of damage and increase your various character stats by certain amounts. The weapons also have different sizes, and a larger size both increases the reach of your weapon as well as obstructs your field of view as it takes up more room on your screen. Obviously large weapons are better for melee classes since they can hit more enemies at once, but less optimal for ranged classes because there's more weapon in your line of sight. Your character has stats to indicate his damage, health, speed, tower repair rate, tower attack rate, tower attack strength, tower health, and tower area of effect. He also has two skills that you can activate that are different for each class. The squire has a circular attack to hit enemies around him, and a blood rage to increase his damage and speed considerably. The circular attack has a fixed mana cost, and the blood rage drains mana at an increasing rate until you run out. As you kill enemies, they drop mana and items though, so you can often end up with a steady supply of mana to keep your skills active -- especially in later rounds when your fighting hundreds or even thousands of enemies in a wave. Skills are increased by leveling up your character and distributing the available skill points into whatever stats you desire. They're also increased by the extra stat points that come on the equipment you pick up and equip. Equipment can be further upgraded by taking it to a forge and investing an increasing amount of mana into it, up to the maximum level listed on the equipment. Every upgrade you can choose to increase one of the stats on the equipment. The tavern acts as the central hub of the game, where you start off when you first log in and where you meet up in multiplayer games before choosing a map. There's a forge there, as well as a vendor to buy a couple pieces of equipment from. The equipment changes after you finish a map, and the quality of equipment depends on which map and which difficulty you were playing when you finished it. There are also some training dummies in the tavern that you can attack to test your damage, as well as place towers to attack them to test your tower damage. There are a few issues with progression, leaving you grinding the same maps for long periods of time in order to get small upgrades until you can progress to the next map or difficulty level. These happen at a couple points, but the most notable is progressing between insane difficulty and the new nightmare difficulty introduced in a DLC pack. Then again progressing between nightmare mode and the nightmare survival maps. There's also a constant stream of patches for the game, tweaking one thing after another in an attempt to bring some balance. You can tell Trendy Entertainment isn't a large company with millions to invest in getting everything "just right" before release, as it seems like they're trying to fix it as they go. You can play Dungeon Defenders in either a first-person or a third-person view, you have but to scroll the mouse wheel to move the camera to switch between them. The graphics are extremely polished and fluid, with smooth animations and detailed particle effects. The game reminds me a lot of Torchlight or World of Warcraft with it's cartoony style and smooth gameplay. The level designs are varied, featuring a number of different indoor and outdoor levels, mostly themed around the castle that you're climbing as part of the story line. The background music is well done and only adds to the ambiance of the different levels. It isn't distracting or repetitive at all, and I actually leave it turned on and not muted in this game. The sound effects consist of all the explosions, clangs and grunts that one would expect. System requirements include a 1 GHz dual-core processor, 1 GB of RAM, 2 GB hard drive space, a 256 MB video card that supports DirectX 9.0c and Shader Model 3.0, as well as broadband internet if you're going to be playing online. It runs great on all 3 of the desktop computers I've played it on. It does run on my sister's laptop (a Toshiba Satellite L675 with integrated Intel HD graphics), but it stutters a lot and is glitchy even on the lowest settings. Playable enough for her young children to enjoy, but no fun for anyone else. Overall Dungeon Defenders is a wonderful game, and the crossing of action RPG and tower defense is well executed. The interface for placing towers with the mouse only is a little wonky, but since the towers also have hotkeys that are mapped to the number keys, this minor quibble can be easily overlooked. It's well worth the respectable price tag, and if you can catch it on sale at Steam like I did then there's no excuse for not picking up a copy or four. 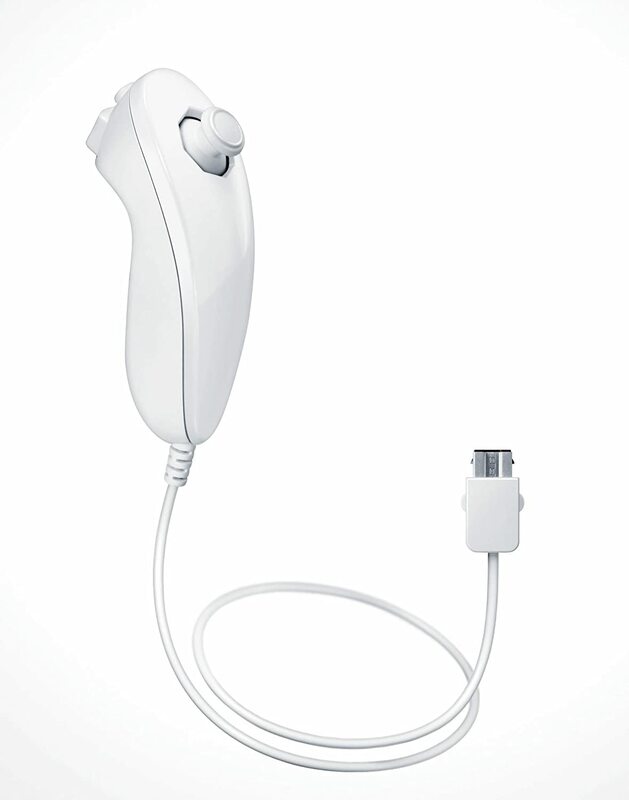 The official Nintendo Wii Nunchuk Controller is not a controller itself, but one of many different accessories that plug into the bottom of the primary Wii Remote for the Nintendo Wii. The Nunchuk features a three-axis accelerometer just like in the Wii Remote, so it has its own separate tilting and motion-sensing capabilities that work in conjunction with the ones in the primary Wii Remote. This is especially useful in sports and FPS games, where you can usually move around with the Nunchuk's joystick and still perform regular game actions with the Wii Remote's buttons and trigger. The Nunchuk is approximately 4.5" long, 1.5" tall and weighs less than 2 ounces with its hard plastic body. It's about 1.5" wide in the front and tapers down to about 1" wide near the back where the cord attaches. The cord is about 3' long and plugs into the bottom of the Wii Remote, leaving you plenty of slack to hold the Wii Remote in one hand and the Nunchuk in the other. There is a clear plastic clip on the end of the cord near the plug that allows you to slide in the Wii Remote's wrist strap so that if it accidentally gets tossed it can't travel any further than the length of the cord. It has a slightly C shaped contour where the front and back are both lower than the middle to make it comfortable to hold in your hand, and it works well for all size hands (as well as for both right and left handed people). The top of the Nunchuk features an analog joystick with a comfortable rubber coating to operate with your thumb, and there are two buttons on the very front that you can press easily with your index finger. The top one is a small round C button, and then there is a larger rectangular Z trigger button underneath it. After so many years of standard controller use for gameplay, I usually use my Wii Classic Controller Pro for games that support it. For everything else the Nunchuk is a godsend though, and the control schemes seem to be very good in general. I do wish that the Nunchuk was wireless like the Wii Remote, but the 3' cord isn't too obstructive or intrusive since you're usually holding both devices simultaneously anyway. At least it's not getting tripped over or preventing you from sitting further from the Wii, so I really can't complain. As an added bonus, that means no batteries to replace since it draws power from the Wii Remote. Not every game requires the Nunchuk, though a great many of them do. Even the games that don't explicitly require it will usually support it in one way or another, making the Nunchuk a truly must-have accessory for the Wii. For that reason I recommend that you pick one up for each and every Wii Remote that did not come with one out of the box.